Carl Irmer (1834–1900), Painter on a Baltic Beach (c 1885), oil on paperboard on wood, dimensions not known, Albert-König-Museum Unterlüß, Unterlüß, Germany. Image by Hajotthu, via Wikimedia Commons. The history of painting is full of strange coincidences, chains of events which, taken together, appear quite incredible, but which determine the course of art. In this article and the next, I am going to trace one such chain, which takes us from some fine coastal landscape paintings made on the shores of the Baltic, up to the fjords of Norway, then into one of the melting-pots of art at the end of the nineteenth century, to an artist who was a driving force in early twentieth century art, and another who has been so completely forgotten that we don’t even know when she died. We start with Eugen Gustav Dücker (1841–1916), who was born in the town of Arensburg, on the southern coast of Saaremaa Island in what is now Estonia (where it is now known as Kuressaare). In those days, it was in the Governate of Livonia, on the far westen edge of the Russian Empire. His artistic talents recognised, Dücker trained at the Academy of Arts in Saint Petersburg, and moved to Düsseldorf in Germany – not unsurprisingly, as he was a Baltic German. Dücker became an established landscape painter, associated with the Düsseldorf school of painting, and seems to have taught at the Staatliche Kunstakademie in the city. This school had grown during the 1830s, and paralleled the changes taking place in landscape painting in France at the time, placing emphasis on painting en plein air using relatively subdued colours, but rather brighter than the Barbizon School. Typical landscapes were still quite finely detailed, although styles became more painterly as time passed. The Düsseldorf school was particularly important in its influence on painting in North America: many of those in the Hudson River School trained in Düsseldorf, including William Stanley Haseltine, and Eastman Johnson, although Albert Bierstadt was unsuccessful in gaining admission! 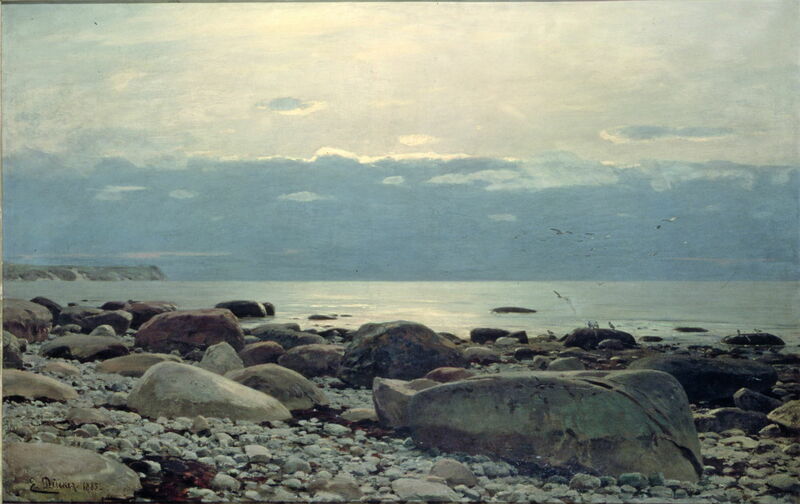 Most of Dücker’s surviving works were painted on the coast of the Baltic Sea, many back in Livonia/Estonia. Eugen Dücker (1841–1916), Rügen (1885), oil on canvas, 85 x 132 cm, Museum Kunstpalast, Düsseldorf, Germany. Wikimedia Commons. 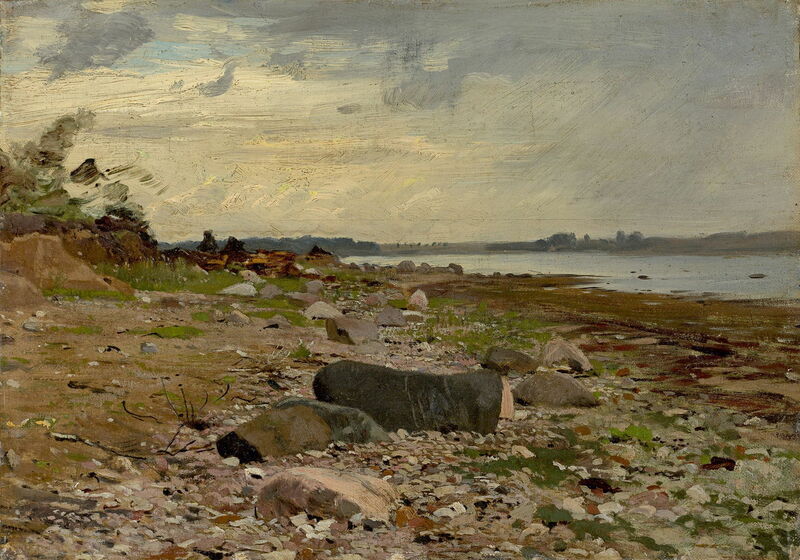 Eugen Dücker (1841–1916), Stony Shore (date not known), oil on canvas on cardboard, 28.4 x 40.3 cm, location not known. Wikimedia Commons. Despite the foreground detail in his undated Stony Shore, the background and sky are wonderfully painterly, and it is likely that this was painted in front of the motif. Eugen Dücker (1841–1916), Fishing Boats on the Beach (date not known), oil on panel, dimensions not known, Albert-König-Museum Unterlüß, Unterlüß, Germany. Image by Hajotthu, via Wikimedia Commons. Visible brushstrokes and some heavy application of paint are also apparent on Dücker’s undated oil sketch of Fishing Boats on the Beach. 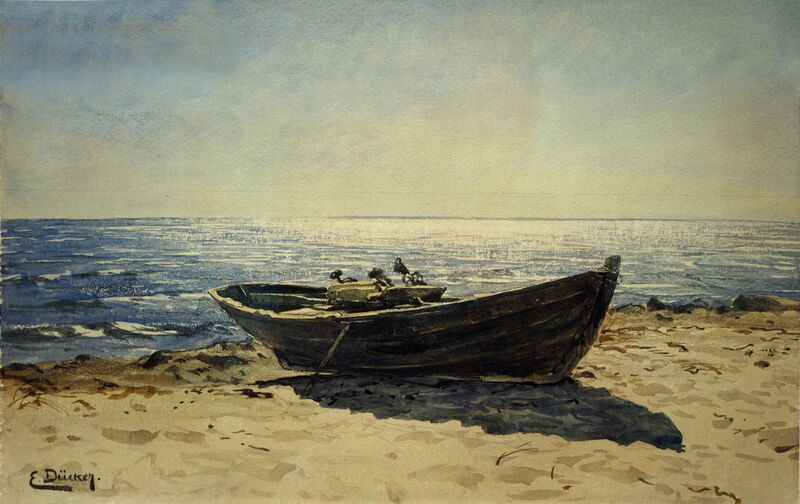 Eugen Dücker (1841–1916), Fishing Boat on the Beach (date not known), watercolour, dimensions not known, Albert-König-Museum Unterlüß, Unterlüß, Germany. Image by Hajotthu, via Wikimedia Commons. Dücker also appears to have been an accomplished painter in watercolours. This undated view of a Fishing Boat on the Beach uses a range of advanced techniques, which may have included scraping and the application of salt grains, and were founded on the use of transparent watercolour. It has some gestural marks too. 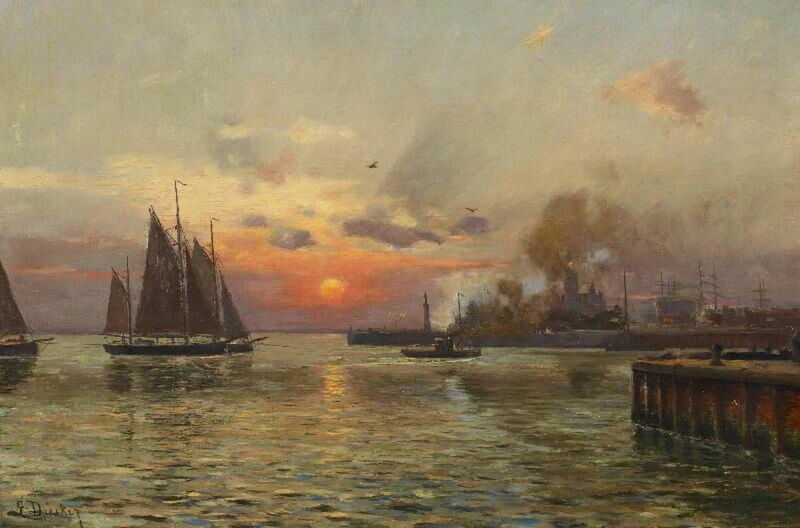 If the title of his Morning Fog at a Port at Saint Petersburg, from about 1890, is anything to go by, Dücker must have returned to paint on the river near Saint Petersburg. This view looking into the rising sun makes excellent use of colour, and has sophisticated handling of reflections in the broken water surface. 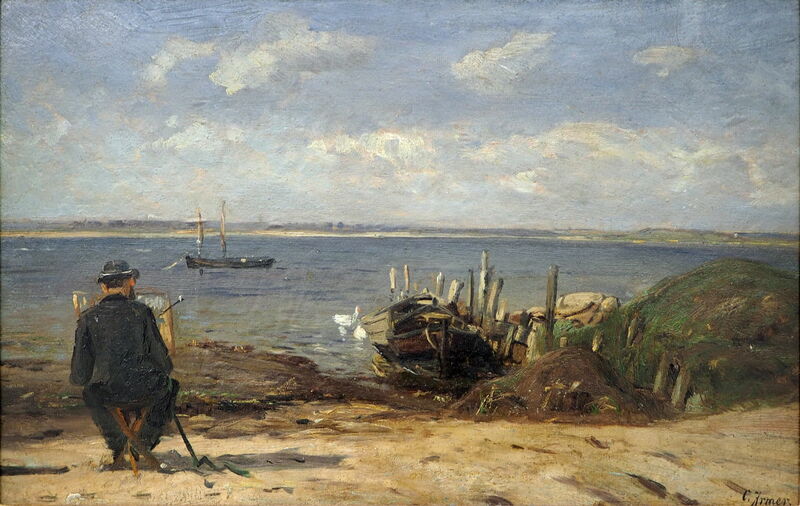 This plein air sketch of an artist at work was painted by Carl Irmer, and is reputed to show Dücker working at his easel, as a Painter on a Baltic Beach (c 1885). By the 1860s, Dücker was teaching actively. One of his pupils, between 1869-72, was the Norwegian artist Adelsteen Normann (1848–1918). Normann had been born in the countryside near the town of Bodø, well to the north up the Norwegian coast. As with many of the best Nordic artists at the time, he travelled to Germany to train, and started his studies at the Staatliche Kunstakademie Düsseldorf in 1869, where he was taught by Eugen Dücker and others. Like most of the Nordic painters training and working in Germany and France, Normann returned home in the summer, where he caught up with family and friends, and painted. 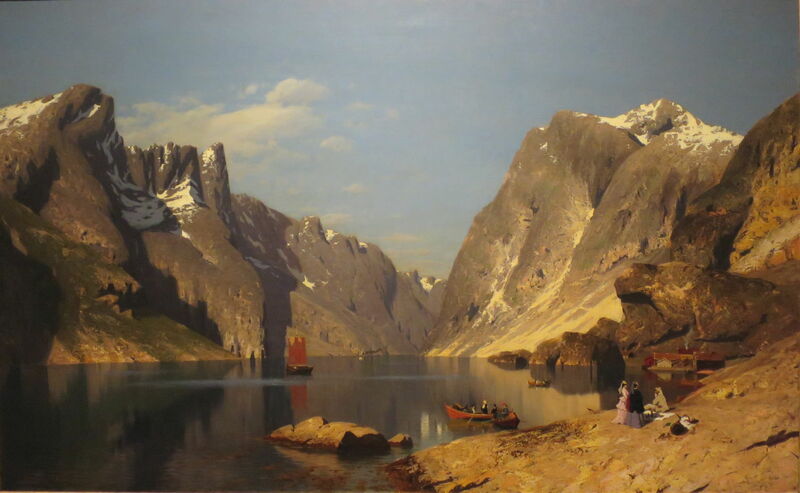 In his case, he concentrated on dramatic views of the coastal fjords, which became popular on the German market. In 1883, Normann moved to Berlin, where he seems to have done a good trade with these fjord views. It has even been suggested that he was instrumental in building the tourist trade, attracting German visitors to see the spectacular Norwegian scenery. Eilert Adelsteen Normann (1848–1918), From Romsdal Fjord, 1875 (1875), oil on canvas, dimensions not known, Bergen kunstmuseum (Kunstmuseene i Bergen), Bergen, Norway. Wikimedia Commons. 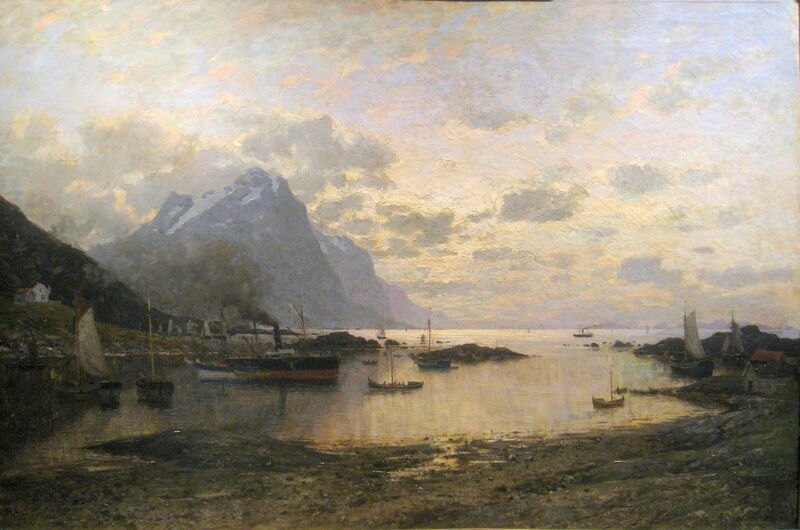 Normann’s From Romsdal Fjord, painted in 1875, is the earliest of his dated works that I have located. It shows the ninth longest fjord in Norway, which carves its way through a huge mountain gorge. A small party of well-dressed people have arrived in small boats, for a picnic on a rock spit. A sailing boat is gliding slowly along the mirror surface of the water, and in the far distance is a steamer. Eilert Adelsteen Normann (1848–1918), Romsdal Fjord (1877), oil on canvas, 112 x 191 cm, Nationalmuseum, Stockholm. Image by Linn Ahlgren, via Wikimedia Commons. 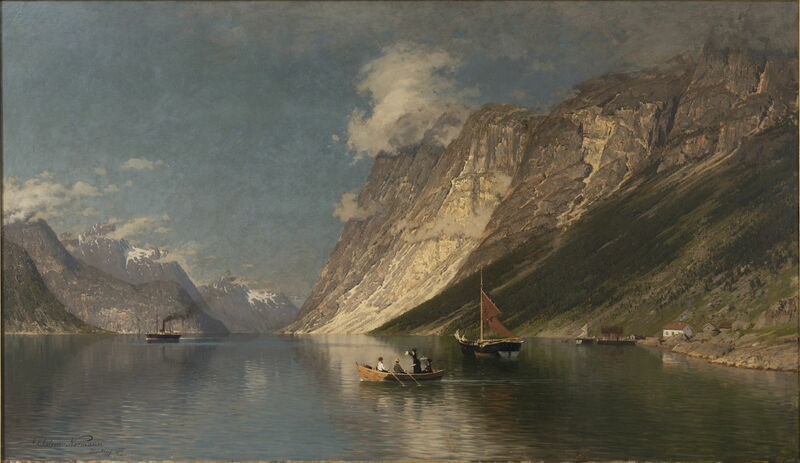 A couple of summers later, Normann returned to the same fjord and painted Romsdal Fjord (1877), using a similar formula for its staffage. Next to his signature, at the lower left, the artist states that this work was painted not in Norway but Düsseldorf. Eilert Adelsteen Normann (1848-1918), Steamship Calling at Lofoten (1885), media and dimensions not known, Norsk Maritimt Museum, Oslo, Norway. Wikimedia Commons. Steamship Calling at Lofoten (1885) shows this mountainous archipelago in the far north of Norway. Steamship services replaced other forms of transport for shipping goods and cargoes along the coast of Norway from about 1880 onwards; that in this painting appears to be a small coaster which most probably moved bulk agricultural cargoes on a fairly regular basis. Normann had also successfully exhibited at the Salon in Paris since 1882, and during the 1880s seems to have met with modest success there. In Munich, the biggest centre for art in Germany at the time, the reception given to Impressionism had been reactionary. The State actively promoted traditional styles, embodied in the conservative Munich Artists’ Association. Bitter debate grew in the late 1880s, and in 1892 many artists separated into a progressive rival organisation: this was the Munich Secession. In Berlin, matters started to come to a head during the 1890s, resulting in the Berlin Secession in 1898, among whose members were Lovis Corinth, Max Liebermann, Otto Modersohn, Max Slevogt, and Edvard Munch. In 1892, Normann was a member of the board of the Verein Berliner Künstler. During his seasonal visit to Norway, he exhibited some of his fjord landscapes in Oslo, at the Kristiania Art Society, at the same time that the young Edvard Munch was exhibiting some of his paintings in the city. Seeing the opportunity, on his return to Berlin in the autumn, Normann extended an official invitation to Munch for him to exhibit his work in Berlin. Posted in General, Life, Painting and tagged Dücker, history of painting, landscape, Munch, Normann, painting. Bookmark the permalink.